Remember this scandal? When the company was afraid of people doing something with his “giving the finger” to the camera. Which by the way I really doubt he was, and if he was, he needs to do it right. Anyways, well thanks to them, someone did and well, we couldn’t help but put it up and share it with all of you. Quite frankly it’s pretty darn funny and I feel sorry for CL. If I were her, I’d demand an apology from Jiyong, because really, he walked in on this one and landed her in the middle of it. He has no one to blame but himself. Oh yes and on top of that this, G-Dragon has been sponsored by Louis Vuitton to endorse shoes. LV is one of the most popular brand names around the world. Louis Vuitton has never sponsored anyone in Korea, so G-Dragon is the first celebrity to be endorsed. They have already given him a pair of shoes from Kanye West’s line. 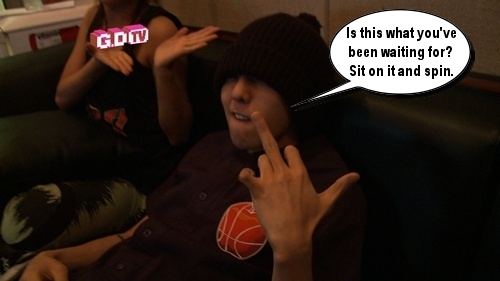 The only thing they want from GD is to wear it. The self-proclaimed ‘fashionista’ caught a big fish and gets to bathe in the luxery of sneakers that probably only took $30 to make but really cost $500. 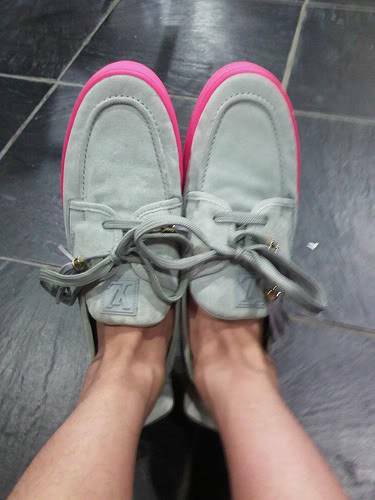 Wore the new shoe and tried running around in it ^^ Ahh this is addictive much?